Welcome to our website. You can use this site to learn more about the things we do in the district and how to make contact with us. This page gives you an overview of who we are, and other pages give you more detail on how we raise money and where that money has been donated. You may need to contact us if you need our help or if you would like to join us. In either case you can contact us using any of the e-mail addresses you come across on this site and we will get back to you. We meet on the third Monday of each month at 19:30 at the Chippenham Golf Club, Malmesbury Road, Chippenham, Wiltshire SN15 5LT. This popular day will take place on 2 June and will now be held in the fields of Meadow Farm Nurseries, Langley Burrell, SN15 4LW. To find more about is event and how to get there, use the menu button on the left to get to our dedicated page. We held our Aution of Promises on Friday 29 March at the Town Hall and were pleased to have offered 100 Lots over the course of 2 hours. Figures are still to be finalised, but we expect to have raised over £5,300 for Wiltshire Air Ambulance and Lions Charities. Persimmon whose generous donation allowed us to cover all expenses and more for this event. Chippenham Town Council for awarding Chippenham Lions monies from the Community Award Budget to has cover the cost of the hall hire. The individuals, families, businesses and companies who generously donated the splendid selection of Lots. And to all those who submitted commission bids, appeared at the auction and bid so generously. The club is proud to have collected £1,393 on behalf of the Marie Curie, Great Daffodil Appeal at Morrisons Super Store over two days in March. 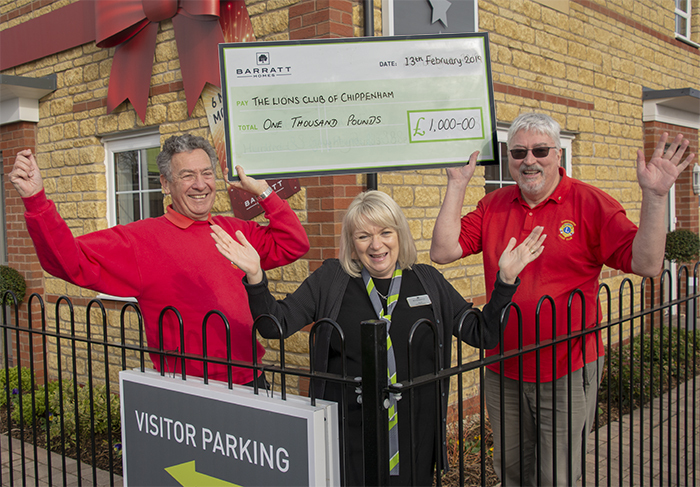 Barratt Homes who are currently developing Birds Marsh View in Chippenham have presented us with a cheque for £1,000 towards the costs of putting on the Cherished Vehicle & Family Fun Day on 2 June. To find more about this event visit the dedicated page from the button on the left. Exciting News - we have a new venue for 2019 and you can find out more by visiting or dedicated web page from the menu on the left. 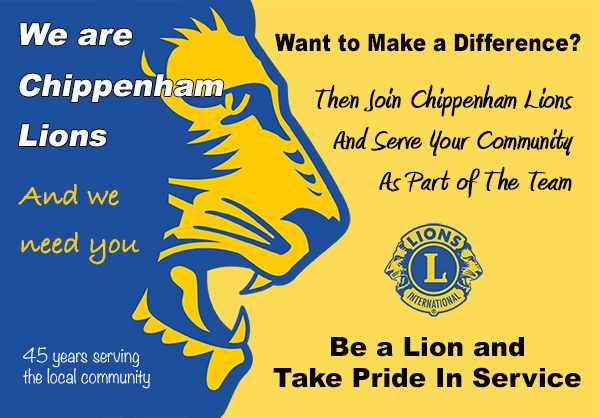 The Lions Club of Chippenham is one of those 44,500 clubs across the world that are part of Lions Clubs International. Each year Chippenham Lions raise about £30,000 for local causes and international charities. Lions believe that local people are best placed to provide help and support to less fortunate members of the community in Chippenham, Corsham and the surrounding villages. - Fund Raising on behalf of various local charities including Air Ambulance, Transport for the Disabled and St Nicholas School as well as individual assistance to local needy, aged and disadvantaged persons. - Community Service Work to provide entertainment, outings and sporting facilities as well as providing hot dinners on Christmas Day for those spending Christmas alone. As well as this work, every month Chippenham Lions enjoy at least one social event – an informal or formal night, or a picnic, trip or visit to the theatre or something similar. A full diary of events can be found at the Calendar link on the left and our more immediate fund raising, welfare and social events are featured above right.